I hope you're all having amazing Holidays with people you love. 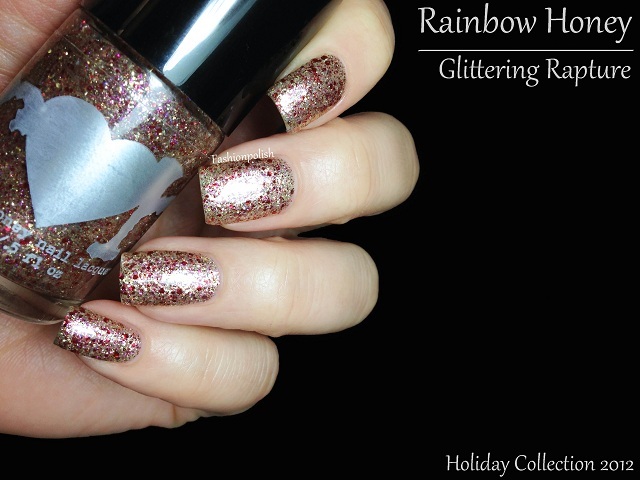 Today I have a very fitting collection to share with you : the Rainbow Honey Holiday collection! 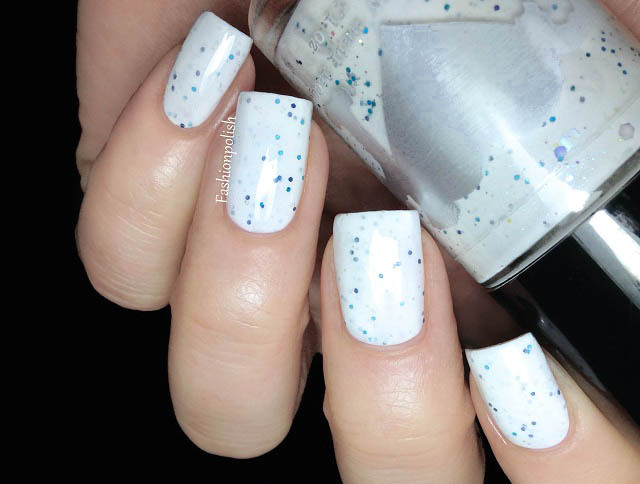 Spirit of Wonder is an opaque white base filled with blue and holographic glitter. Definitely perfect for Winter! Formula was fantastic and applied nicely and easily in 2 coats, just maybe a tiny bit too opaque as the glitters tend to be lost in the opaque white base. This is 2 coats plus topcoat. Annual Emotion is a silver foil shimmer with a very slight holo. In the bottle it looks like a plain foil but once applied under certain lightings you can definitely see a the faint rainbow, adding an extra something for the usually non-holo lovers. Formula was once again flawless and I applied 2 coats plus topcoat here. Gilded Angel is a gold version of Annual Emotion : exact same finish, effect and formula. 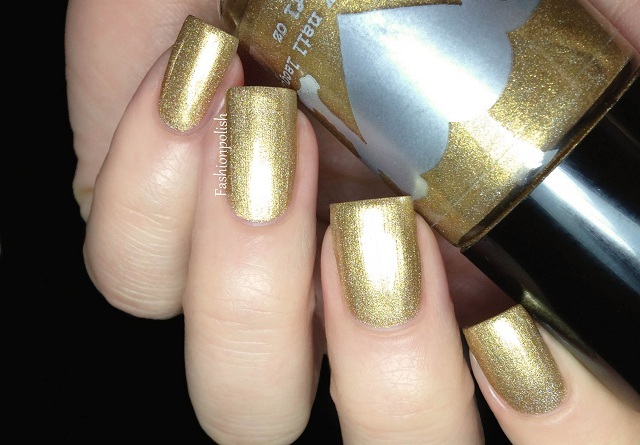 Easy to apply, foil shimmer with a faint holo, opaque in 2 coats. 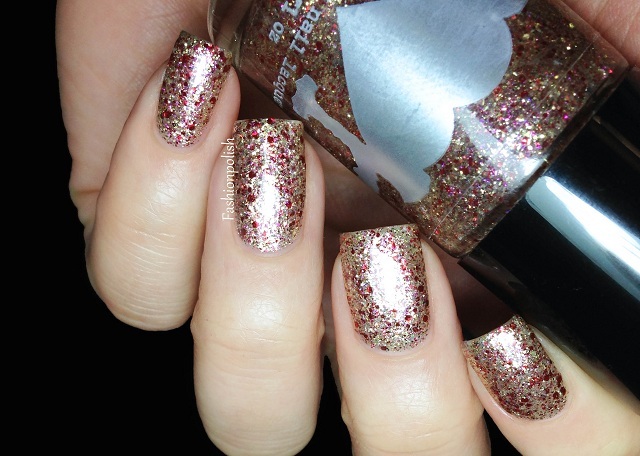 Glittering Rapture is a mix of different sizes of red, pink and gold glitter in a clear base. This one definitely calls for Christmas! Formula was a little thicker than the others but oh so easy to work with. I used 3 very thin coats plus topcoat here and they applied like butter, even layers and fast drying time. This is my very first experience with Rainbow Honey and I need to say that I'm impressed! The professional packaging, beautiful bottles and high quality formulations, everything's just perfect! Rainbow Honey is available for purchase at rainbowhoney.com or through their international etailers and retails for $10 (15 ml) or $5 (7ml). Free shipping on all orders of $25 or more until 12.31.2012. 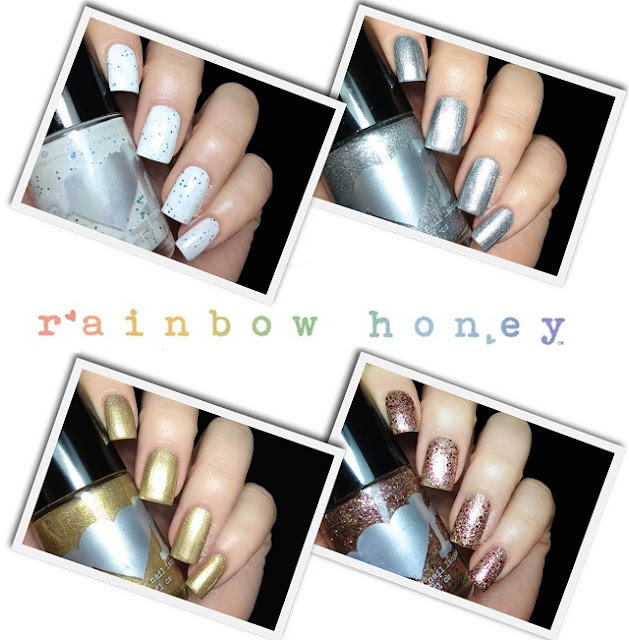 For more information, please refer to Rainbow Honey on their website, Twitter or Facebook. Very nice! You mentioned beautiful bottles and nice brushes. I'm a sucker for a nice packaging but the bottles look to me like a generic bottles, Aren't they? How are the brushes? I got super spoiled by YSL brushes so now I mostly use YSL polish because it's so easy to apply.